Delivering intensely practical astronomy to humanity since 1995! Go to 'Stargazing Tours' for details on Broome's Astronomy Experience. Our 'Event Calendar' will let you know the best nights to book and also everything else that Greg is doing including television and corporate events. If you know what you want already, book here. STARGAZING LIVE 2017. Greg Quicke, (#SpaceGandalf), and Professor Brian Cox team up for 6 shows on the 1st series of the BBC's Stargazing Live 2017 program and the ABC's version of Stargazing Live 2017. Watch the reruns here. STARGAZING LIVE 2018 on IView for ABCTV with Greg Quicke, (#SpaceGandalf), Professor Brian Cox, Julia Zemiro, Kumi Taguchi, Dr Lisa Harvey Smith, Alan Duffy and more. Nas Daily on facebook made this 1 minute video in Broome with Greg Quicke. In 2 days it got 1.2 million views. Have a look to see how many its got now! Greg Quicke's 10 part TV series, A Stargazers Guide to the Cosmos, is now available for binge watching on ABC's IView. 8 of these parts have also been made into a 1 hour special edition of A Stargazers Guide to the Cosmos show on ABCTV in May 2018 and still available on iView. Listen to Greg Quicke and Richard Fidler on the ABCs 1 hour radio podcast, 'Conversations' here. Listen to Alan Duffy's Cosmic Vertigo podcast on Stargazing Live 2018 with Greg Quicke. To buy Greg's Earth Turning Consciousness book and other astronomy books and starcharts come and see us at Gallery Sobrane. You are going to want to visit Sobrane's Gallery anyway because it is beautiful! Astronomer Greg Quicke learns from Dr Noel Nannup how Indigenous Australians read the night sky, and how ancient pathways are helping people navigate this vast land even today. Is the Moon upside down? Astronomer Greg Quicke gets in a spin to explain why the night sky looks different in Australia compared to the UK. Astronomer Greg Quicke finds out how unlocking coral's unique relationship with the Moon could help scientists save the Great Barrier Reef. Greg Quicke speaks from the heart in a way that people seem to appreciate. ‘When I first started talking about stars I thought I was saying stuff that everyone had already figured out. No, no, keep talking was the immediate response,’ This let Greg know the importance of sharing the simplest things about the other worlds. Even those in the know will comment, ‘wow, I never thought of it like that before’. Greg is increasingly in demand to speak at events Australia wide, wether it be a few days at a remote North Queensland school, a corporate presentation at Sydney Observatory, a talk at your local astronomical society or a guest appearance for a crazy bunch of old car enthusiasts on an outback jaunt. We can do this outside under the stars or in your 2500 seat auditorium. The basics start out at $3300 for a 50 minute talk plus airfares from Greg’s home in Broome and usually a couple of nights accommodation. If you want him for longer, we can talk about it. We offer the following scenarios in Broome, although if you want them in other locations, we can talk about that too. You can have the lot with big telescopes, tables set with white linen under glorious Kimberley skies and a chef feeding you your choice of catering styles while you listen to some home grown live music inspired by the very land you find yourself in! Coordinating the event, you’ll have access to Greg’s half-a-lifetime of experience living under the stars to entertain you with some mind blowing insights into our local area of space using electric green lasers to point out stars, constellations and deep space delights. A night of large and quality telescopes, fine food, entertainment and unforgettable memories that will exceed your expectations. Let us know your budget. This is the one for your small group intent on having uninhibited access to Greg's powerful revelation inducing insights for a few hours under some awesome Kimberley skies. We'll pull out the high-end telescopes and take the night in any astronomical direction you would like to take it, following up with some campfire time as the ideas start to flow. You can eat before you come, after you go back to town, bring your own catering or have us set up some catering so that you can settle in for the night. Bring your swag if you are really serious. Starting at $9900 including GST. We bring a couple of big telescopes to your event in or around Broome. Greg jumps in using lasers and powerful analogy to introduce you to the sky in a way you may never have thought about before. We’ll work around your catering and coordinate your event into a memorable and entertaining night with astronomical titbits and spectacular telescopic views mixed in between hors -douvres, main course and desert. Talk to us about your proposed location and we will let you know how well it will work. Starting at $9900 including GST. Fly Greg into your exotic or outback location with a selection of high-end telecopes for that special insight into some powerful country, sea and sky. A light plane, a 5 inch Apochromat Refractor (look it up) and Greg Quicke all to yourself. Starting at $9900 including GST plus extra days. Greg comes to your event and walks on with lasers blazing and a presentation that will blow your mind. Telescopes are one thing. Finding out about where you are in the universe is another. You can have Greg for a quick 10 minute WOW around the sky or put him on for an hour with time for questions that relate to the nature of reality itself. We leave the telescopes home for this one so your set up costs are minimal with still enough punch to have you talking all night. Starting at $3300 in Broome and $6600 for the away from home gigs Australia wide, including GST. We can do all of the above Broome events for your group of 2, 6, 10, 30 or 200. Our 'Bare Bones' presentation easily caters for larger groups, occasionally running into the thousands at events like the Shinju Matsuri finale at the Cable Beach Amphitheatre. We run a regular 2 hour show, Broome's Astronomy Experience, on a weekly schedule at our Astro Tours Bush Launchpad. These regular events fill up with individual bookings of 120 people a night using a fleet of serious telescopes and designer tiered swivel seating grandstands. Thank you for thinking of us to WOW your clients! 48 Carnarvon Streeet, Broome, Western Australia. Published by Wilkinson Publishing, Collins Street, Melbourne and due for release October 2016. WHAT SORT OF TELESCOPE WILL I BUY? is a question I'm often asked. How well do you know the sky? Not very well is often the answer. Then don't buy a telescope is my advice. However, do buy a pair of binoculars and do buy a star chart and start to learn your way around the sky. People who buy a telescope for themseves or for a loved one, often get it out under the sky on the first night, and can't find anything. They get it out on the 2nd night and still can't find anything. Then that new shiny telescope goes under the bed and stays there for many years. I hear this very often. I can see some of you nodding your heads. WHAT SORT OF BINOCULARS WILL I BUY? Binoculars are awesome for every part of your life and when you point them at the sky they will show you hundreds more stars than you can see with the naked eye. They will bring the craters on the moon to life, they will show you the moons of Jupiter and they will reveal many beautiful star clusters and formations that are only a hazy blur with the naked eye. Who knew that the Milky Way is just lots and lots of stars? Whoever points their binoculars at the Milky Way's glories is who. See, even if you do buy a telescope, you will still need a pair of binoculars to find the things you want to point your telescope at. Binoculars are a joy in their own right! They are my favourite way to look at the night sky, (apart from simply lying on my back under it). If I am going out under the stars on my own, (and I have lots of big fancy telescopes to choose from), I only take binoculars! 10 X 50, 8 X 42, 20 X 60? Binoculars have 2 numbers, like 10 x 50. 10 is the magnification and 50 is the aperture of the front lens in mm. For hand holding you want no more than 10 times magnification. Even better is 8 times. Everybody wants the highest maginification because more is more, right? More magnification means more difficult to use (like forget it), unless you are going to mount your big powerful binoculars to hold them rock steady. 10 x 50s are ideal for astronomy and everything else in your life too. Actually I prefer 8 x 42s because they are that much lighter and smaller to travel with. The technology being put into the 42mm lenses means they gather almost as much light as an average pair of 10 X 50s. Small birdwatching binos of 25mm aperture are unsuitable for stargazing as they simply don't have the light gathering power. You can get a pair of binoculars for $100 and you will get $100 worth. Or you can spend a couple of thousand dollars and get awesome value in terms of the incredible quality you will see. Remember, you might only buy one pair of binoculars in your life, so it is worth making them a real pleasure to use. Somewhere in the middle at around 4 to $500 will get you something waterproof, dustproof and drop proof. Spend a little more and you will also increase your joy. Yes, it does make that much difference! OK, SO YOU ARE READY FOR A TELESCOPE. Binoculars will get you started and put a vital astronomical tool in your hands for getting the best out of your telescope. However, they won't show you much detail on the planets and they will only tease you to want more when you come across a spectacular Globular Cluster with them. So then it is time for you to consider a telescope. My favourites are the Dobsonian Telescopes, designed and given to the world by the most amazing John Dobson. 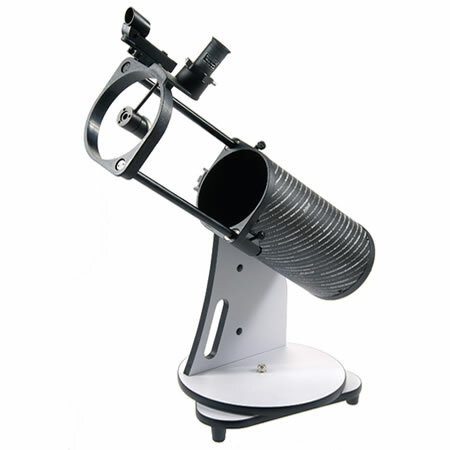 They use a simple and easy to use mounting so that you can spend more on the telescope itself. That means you can get into a semi serious telescope for not very much money. 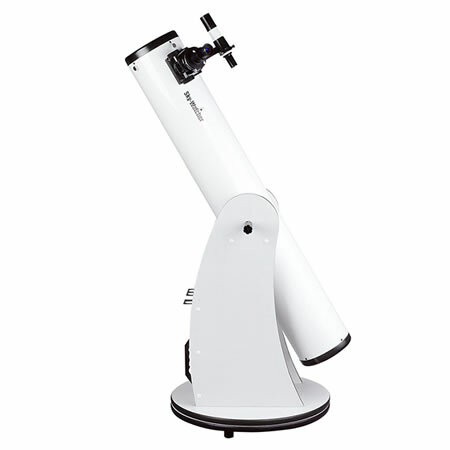 We have Skywatcher 5 inch Dobsonians for $399. These will fit in a cupbord in your caravan. A 6 inch for $449 (on special for the month of July at only $399) needs a bit more room and an 8 inch for $649 will go on the back seat of your car. We've got them in 10 inch, 12 inch, 16 inch and bigger at Astro Tours where you can try them out. Order them here or pick one up at Gallery Sobrane, 48 Carnarvon St, Broome. These are your classic look through telecopes using lenses. Some of the cheaper ones need chucking over the back fence so buyer beware. Spend a little extra money though and you will have years of joy. 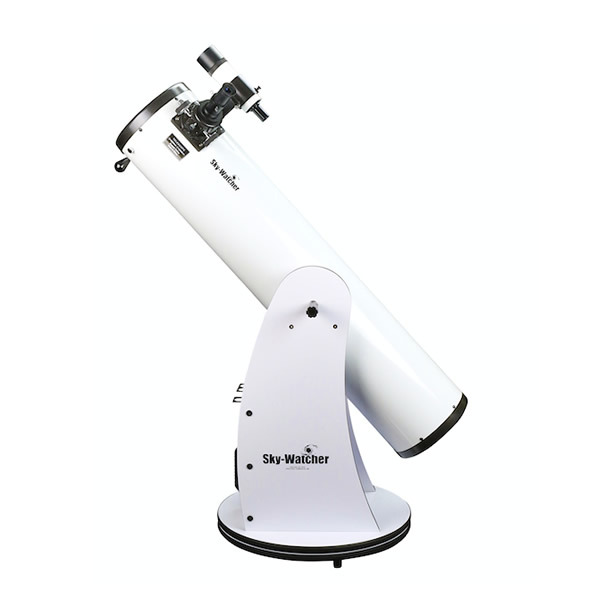 Here's ones of my favourite Skywatcher 102mm refractors on a very easy to use Alt Azimuth mount for $699. Again, you can spend a lot more and maybe a little less. Again, you might only buy one, so make sure it is one you can actually use! Astro photography requires an equatorial telescope mounting so that time exposures can be shot while the sky is 'tracked' by the camera and the telescope. This usually means learning a little more about how to set such a mounting up so that it is in alignment with the earth's axis. Having said this, in todays age, a computer will often handle this tricky stuff. The tricky stuff about computers though, is that they are computers. HOW BIG? AND HOW MUCH? While cheap telescope brands will brag about how much their rubbish telescope magnifies, this is the least important aspect of a telescope. The most important aspect is the size, in mm or inches, of the light gathering aperture. It is very easy to vary the magnification with different sized, or focal length, eyepieces, which simply slide in and out of your focuser. 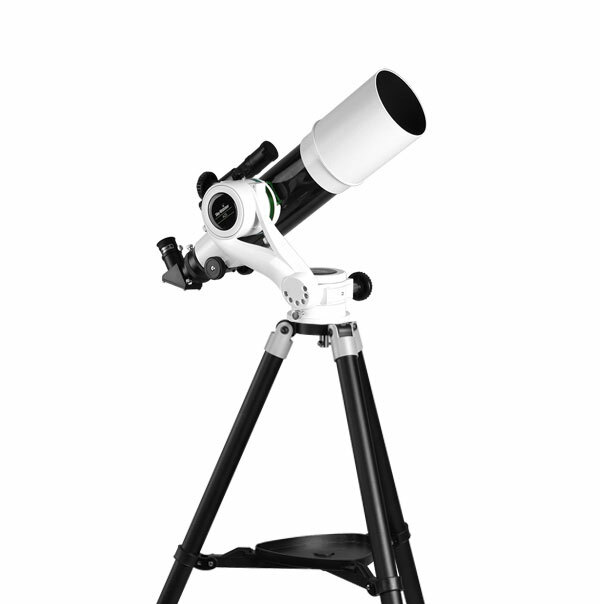 While bigger is better with telescopes, it also makes them more difficult to use and to set up. That's why I am leaning more and more to a simple grab and go telescope such as the 102mm refractor linked above. Having said that I love my big dobsonians too for their sheer light gathering power. For a little more sophisication and $$s, I run a fleet of 8 inch Schmidtt Cassegrain telescopes from 2 of the best brands. These are compact, short tube reflecting telescopes that pack a powerful punch and for me, are the beginning of your serious sized telescopes. We also run an 11 inch version of these on a computer controlled fork mount. This is a serious telescope with a 40 thousand object database. The people who come on Astro Tours are awesome in their own right. They are old, they are young, they are rich, they are budget conscious and they are everything in between. They come from all walks of life from the labourers to the highly educated. Some of them already have a deep knowledge and a degree and more often they are people who may be looking at a dark sky for the first time in their life. The only common thing that I see with all of them is the spark in their eye. And yes, it is so bright that I can see it clearly in the dark! This is my review of the sort of people who have joined me at Astro Tours over the past 2 and a half decades. Very rarely do we get anyone who isn't really meant to be there, although it can happen that the occasional person turns up for the wrong reasons. Although I guess there are no wrong reasons. We generally don't book group tours in because some of the people are only coming because they are a part of the group. The people who find us, are generally independent thinkers and they find us at the right time in their life. They are switched on and ready for whatever is next. If this is you, then come and join us and I will love you just as much as I love every one of you who has been before. I see Astro Tours as an organism with all of us, you the customers, you the regulars, you the interns and you the stars and planets above participating in a universe that is smiling and breathing and encouraging us all the way. GREG QUICKE: WHO IS THIS GUY? Hi, I’m Greg Quicke and I’m delighted you are here on my site checking it out. I’ve had a few “ahaaa” moments about lots of things in my life, just as I’m sure you have. I’ve been sharing a few of mine about our place in the universe with groups of people for a few years now. I love watching peoples eyes light up when they have a few “ahaas” of their own and this is what tends to happen when we come together under the stars at Astro Tours. On my way to making a living as an astronomer, I’ve had lots of fun just doing whatever the next thing seemed to be. I went from high school to James Cook University to do Marine Biology. I got bored fairly quickly with looking in microscopes so I quit and went pearl diving in Broome instead. That was fun and I figured out how the tides work from watching the moon while I was at it. This was my first real astronomical step. I like figuring things out and because I’ve always ridden motorcycles, I figured out how to keep them going. This ability extended fairly quickly into my next career as a mechanic fixing bikes, cars and trucks. I eventually ran my own business servicing Mack and Kenworth trucks, Harley Davidsons and heavy earthmoving gear. This work often took me out of Broome and into the wilder parts of the Kimberley region where standard sleeping arrangements are a swag under the stars. The only roof available and the only one needed for most of the year, was the Milky Way. I didn’t know anything about stars when I started although like anybody else, I was easily blown away with wonder and awe at the incredibly beautiful starscapes of the Kimberley. I got to figuring things out again and started tuning in to the movements of the earth travelling through space. This really blew me away and the internal workings of a Harley v-twin started to look a bit too easy. I bought a telescope. It was big. Everyone wanted to look in it. I started talking, thinking that I was saying things that everyone already knew. “keep talking” was the response, so after a few years of encouragement from friends, fellow business colleagues and interested corporate and individual customers, I started Astro Tours in July of 1995. The rest is history and Astro Tours continues to delight me in its ability to reach people in powerful yet simple ways while providing me with the means to continue sharing the simple insights that still pour quite regularly into the top of my head. I’m writing a book on a life spent amongst the stars, I’m running star shows, I’m presenting to school groups, corporate groups and to amazingly switched on groups of people who come together seemingly at random to join my regular shows. I’m still riding bikes, surfing, I love my garden, chi gung on cable beach in the mornings and meditating in rhythm with the moon cycle. Amidst the chaos, the stars and planets are regular and display an amazing synchronicity, harmony and resonance with each other. It seems to me that everything is exactly in its right place, having exactly the right relationships with exactly the right timings so it may be worth considering that we are too. Enter your details and email below and hit "Get Updates!" Or if you've simply got a question or comment for us. Thanks for making contact with Astro Tours. If you need a fast response call us on +61 417 949 958.